"The machine possesses supreme intelligence, a faultless memory, and a beautiful soul." The Bell Data Communications Seminar was an annual seminar hosted by The Bell System. In 1963, Jim Henson created two films for the seminar starring a puppet robot: a 3-minute short film discussing the relationship between man and machine; and a 7-minute film, "Charlie Magnetico," focusing on communication problems at Magnetico Electronics and featuring Jerry Juhl as Charlie (and all other on-camera characters, with a supporting cast of unidentified hands). The same robot had previously been used in a sketch for a food fair appearance in Germany in 1961, and later appeared on The Jack Paar Program in 1965 and The Mike Douglas Show in 1966. 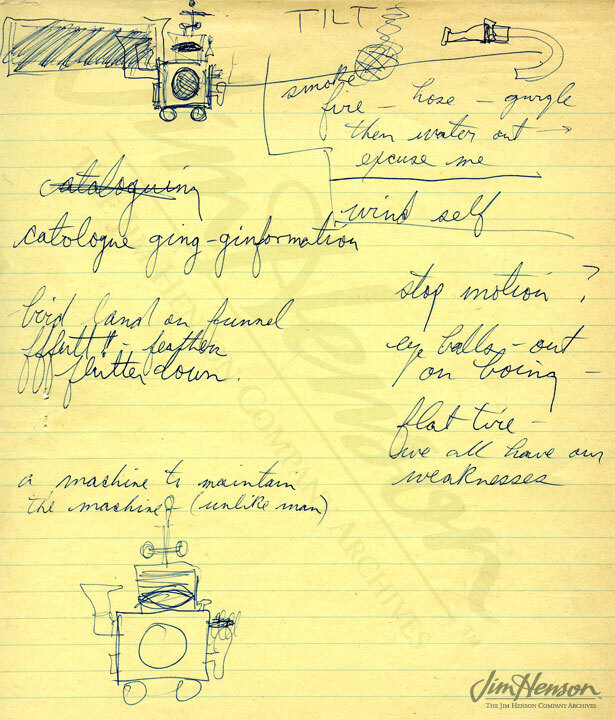 Jim Henson's notes and sketch ideas for the AT&T seminar, 1963.